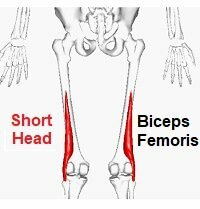 Biceps Femoris is one of the three hamstring muscles found on the back of the thigh. Its name tells us that it has two heads which original quite far apart from each other, the long head, which arises from the pelvis, and the short head, which arises from the femur. The long head of biceps femoris originates (with the semitendinosus tendon) from the lower medial facet of the ischial tuberosity and the sacrotuberous ligament. The two tendons descend together for a short distance before dividing into two individual muscles. The long head of biceps forms a fusiform muscle – a spindle shape with the muscle belly being wider than the origin and insertion. It runs downwards and laterally (from the inner to outer side of the leg) across the back of the thigh, on top of the sciatic nerve. As it nears the knee it narrows and is joined underneath by the short head of biceps. The short head of biceps attaches to the lower half of the lateral lip of the linea aspera, just below the insertion of gluteus maximus, and extends down onto the upper half of the supracondylar line of the femur, with some fibres arising from the intermuscular septum. It runs underneath the long head of biceps and the two parts of the muscle join forming one tendon in the distal thigh. Having joined together, just before its attachment to the fibular head, the biceps femoris tendon splits into three. Some fibres join to the fibular/lateral collateral ligament, some to the lateral tibial condyle and the rest to the back of the lateral intermuscular septum. 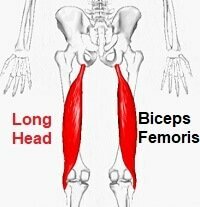 The long head of biceps femoris works with the other hamstring muscles to extend the hip joint, particularly when rising up from a bent position e.g. straightening up after having bent forwards to put on shoes. The hamstrings also control the movement when you bend forwards at the trunk, working eccentrically (lengthening rather than shortening). Both parts of the muscle help to bend the knee. In addition, the long head of biceps rotates the leg laterally when the knee is semi-flexed, and the short head of biceps rotates the thigh and pelvis medially when the foot is fixed/planted. The hamstrings also work to control the forward motion of the tibia during the swing phase of walking, preventing the knee from snapping back into extension. Biceps femoris (and the other hamstring muscles) is commonly injured in sprinters, as it works particularly hard in the push off and initial acceleration phase of sprinting.